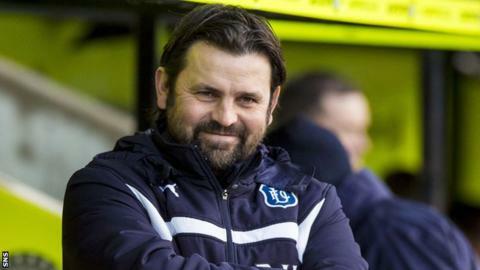 Dundee manager Paul Hartley has admitted that it is proving hard to strengthen his squad as the transfer window draws to a close. Hartley is keen to add depth as the Dark Blues chase a top-six Scottish Premiership finish this season. "We're trying to strengthen, but it's not as simple as that," he said. "We spoke to a couple of players trying to get them in, but it's the other side, other clubs, in terms of getting them out." Hartley admitted that he might end up without being able to add further to his squad before Monday evening's deadline. "It'll be two loans, if we can get two loans in, it might even be one loan, but then again it might not be any loans," he told BBC Scotland. "We're trying our best, but I don't know, it's getting closer to the window." Dundee sit seventh in the table, a point behind St Johnstone but having played one more game. Hartley said a top-six finish is the aim and he is happy with recent form that has led to a five-game unbeaten run since they lost to Dundee United. "We're in good form, it's been a good month for us and the players have just got to keep it going," he added. "We've had a great response since the derby game and that's been a key thing for us I think - their attitude has been first class."